Earlier this month I attended a workshop with trauma worker and author of Trauma Stewardship, Laura van Dernoot Lipsky who spent the day speaking to a group of local agencies and offering important considerations related to self-care and well being when exposed to and involved with trauma work. This all day training based on Lipsky’s book was excellent and provided a lot of nurturing, mindful, and practical reflections and tools that will be very helpful connected to the trauma work I do with children, women, and families. I really enjoyed Lipsky’s content that focused on gratitude as a way to create and maintain a sense of balance in our personal lives and work. She writes, “locating something to be thankful for at all times is an essential part of trauma stewardship” and that this mindfulness practice can help reframe our experience of often overwhelming, challenging, and difficult work. “Remind yourself that while the offering may seem endless, so is what we have to be grateful for; it just might be less obvious and take a more creative approach to find it” (pp. 223, van DerNoot Lipsky, 2009). One of the many takeaways from that day that I have started to incorporate into my daily practice included Lipsky’s suggestion to set “gratitude alarms” on our mobile phone to go off three times a day to help provide a sensory reminder and alert to take time throughout our busy daily activities to reflect on thankfulness. I have set my iPhone for morning, afternoon, and evening gratitude alarms, which has been a rewarding experience. When the alarms go off and I am often in the middle of something, I am forced to go to my phone, recognize the alarm’s intention, and in that moment take time to simply reflect on what I am grateful for. I must say it really has helped make my gratitude awareness stronger and create additional balance in my day to day life. To support this process, I use the “notes” app on my phone to type in whatever thankfulness comes to mind and then save these reflections as an on-going mobile Gratitude e-List. Throughout this week I have started to take words from my list to create Gratitude Wordles as a creative and fun way to express and visually focus on my gratitude words. I have also been experimenting with the app Word Clouder for creating mobile gratitude word clouds on the go! References: Trauma stewardship: An everyday guide to caring for self while caring for others. 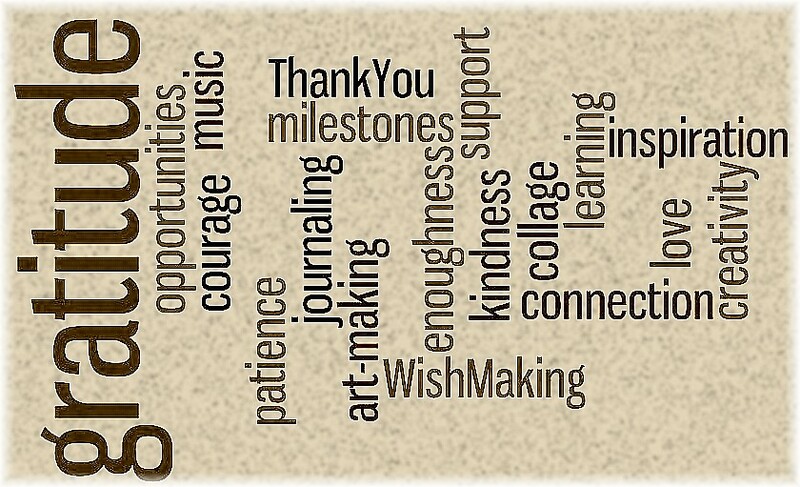 This entry was posted on	June 24, 2011 at 10:00 am	and is filed under creativity, gratitude, trauma, wordle making.